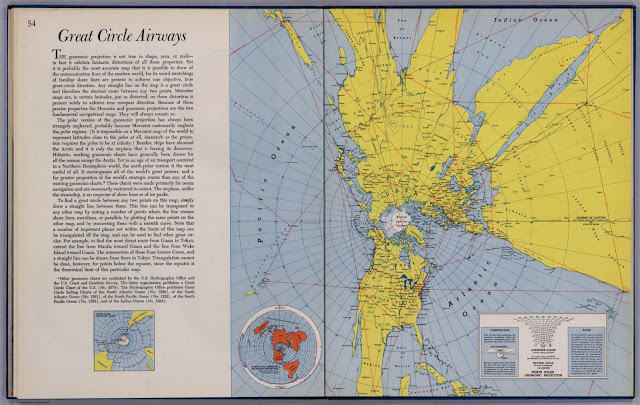 Richard Edes Harrison (1901-1994) was a cartographer active in the 1940s. Harrison studied Zoology and Chemistry at Yale but graduated with architecture, he pursued scientific illustration in New York and published his first map for $25 in 1932 in Time Magazine. Harrison does not have a Wikipedia entry but in the 1940's was very well known. You can find more on Harrison in a paper by Susan Schulten HERE. In 1944 Alfred A. Knopf published an atlas of his distinctive large scale maps of the World drawn from the high perspective of "the air age"; Look At The World: The Fortune Atlas For world Strategy. 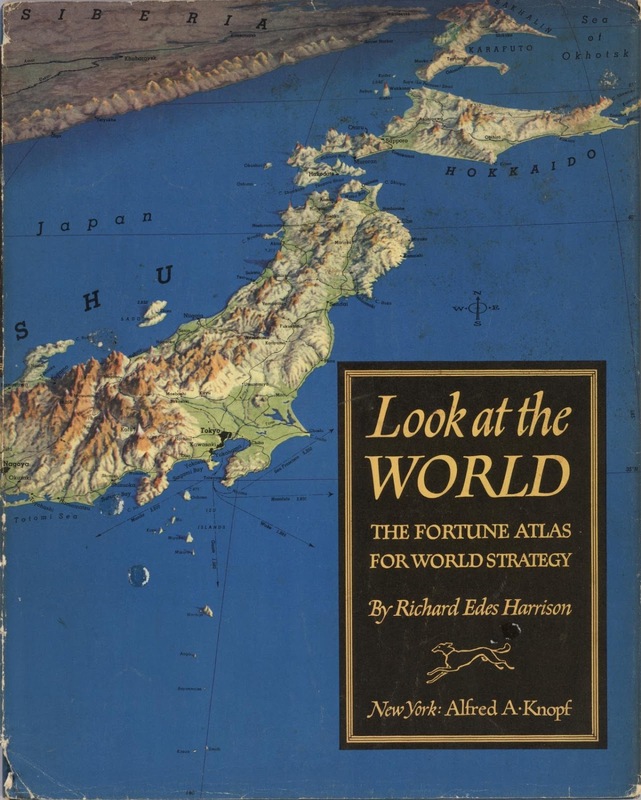 The maps were drawn by Richard Edes Harrison and the text was written by the Editor of Fortune. This is a superb book and many of the images can be accessed and downloaded at the David Rumsey Map Collection website (HERE). For example the image below is an unusual gnomonic mapping showing the Earth from above the North pole. This mapping is used to show Great circles on the Earth surface. The enlarged portion below shows some routes. For example the route from London to New York is shown in this projection as a straight line, which indicates that on the surface of the Earth this is a great circle. 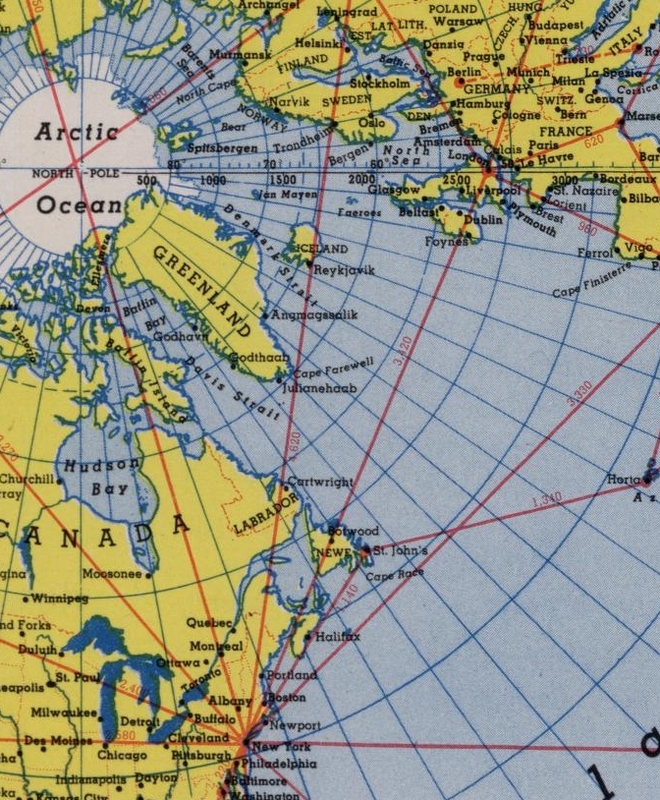 Note that the route goes via a North Atlantic track that leaves Europe near to Shannon airport in Western Ireland and arrives in North America over Botwood Newfoundland. All images from David Rumsey Collection. Copyright Fortune 1944.